At the northern end of Sarson Lane (north of the A303), at its junction with the Amesbury Road, is the war memorial shown here. When I first looked at it many questions flooded into my mind. 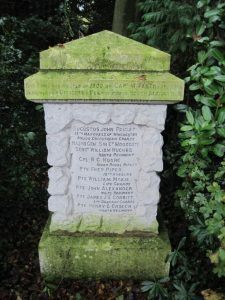 Some were easily answered: at the top it says ‘THIS STONE WAS ERECTED IN 1902 BY CAPT W FABER LATE RHA IN MEMORY OF OFFICERS AND MEN WHO DIED IN SOUTH AFRICAN WAR’. Below it records the deaths of nine soldiers, including the well known local landowner: the 15th Marquess of Winchester. Other questions were unanswered: Why was the memorial erected here? Who was Captain Faber? Who were the other men commemorated? Some of these I have answered below, but several I haven’t. Why was the memorial erected where it is? 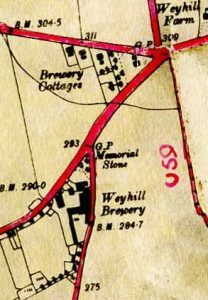 The memorial stone can be seen on this map (c1910). It is now on the edge of a group of houses that have been built on land of the old Weyhill brewery, the Brewery Cottages shown to the north are still there. This brewery was bought in 1888 by a Mr David Faber of Strong’s Brewery in Romsey. Captain W Faber was a partner of Strong’s Brewery and that could be why the memorial is on the edge of the old brewery, which possibly funded it as a patriotic act. Who was Captain W. Faber? He was commissioned into the Royal Artillery in 1877 after attending the Royal Military Academy, Woolwich, and left the regular forces in 1890. From 1900 to 1903 he served in a reserve force, the Wiltshire Yeomanry, but I have not discovered if he went to South Africa. He came from a political family and was MP for Andover from 1906 to 1918: both his brothers had preceded him in this seat before they were ennobled. He was a very influential and active local man: one of his activities was to build the houses near Ludgershall that are known as Faberstown. Its obvious water tower was for his attempt to get running water for all the houses. Who were the other people on the memorial? The one I can identify is Major General Sir Edward Woodgate. He spent many years fighting the 19th century wars in Africa: Abyssinia, the Gold Coast, the Ashanti and Zulu wars. He went to South Africa in December 1899 to command the 9th Brigade of the 5th Division and was specially selected to command the troops tasked to capture Spion Kop where he was mortally wounded on 23 January 1900, dying two months later. He may have been the most senior officer to be killed in the Boer War, but I have not been able to find any local connection. Nor have I been able to find particular connections with the others mentioned: perhaps they were local men or worked at the brewery. Two were from the Hampshire Regiment, one from the Kings Royal Rifles (probably recruited locally) and one from the Wiltshire Regiment. The others were from cavalry regiments, so it is difficult to see if they were local to this area. I would be very grateful for any information about these questions to help build a better understanding of the memorial. The war memorial is very well looked after. My last question is: who keeps it looking so smart? Whoever it is deserves a big ‘thank you’ for keeping a part of our history in good repair!